So this is why he asked me to open the fridge for him. 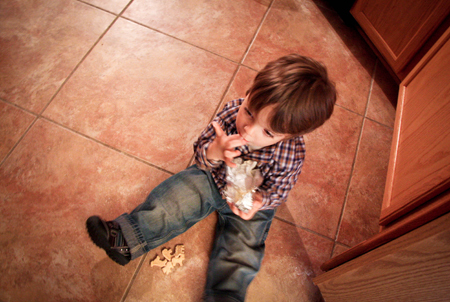 He wanted to sit on the kitchen floor and eat cream cheese straight from the package. I allowed him to indulge for a bit and then put him in his chair for dinner. He pushed his bowl of pasta away and very politely said, "No thanks. Cream cheese for dinner, please, Mom." I should mention that this is likely my fault. When I was his age, I did the same thing except with a tub of butter. I know, totally gross.